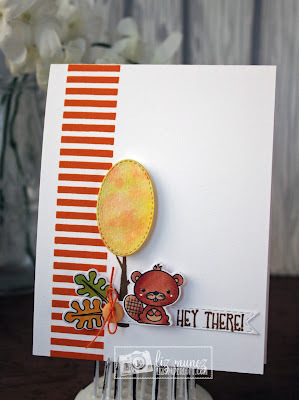 Liz's Paper Loft: MCT August Sneak Peek Day 3 ~ hey there! For the this little beaver I quickly colored him with copic makers, giving him more personality by adding cheek highlights and glossy accents on his eyes. The tree was created by watercoloring with distress inks. Fantastic card and layout! I like the design of the lines down the side. Awesome little detail that doesn't take away from that cute image! Wonderful! This is an adorable card! I love the CAS style and really like that striped border along the side! Cute little scene, definitely makes me want fall to get here already! TFS! Simply adorable! All these little critters are just too cute!! Very cute card! I like this stamp/die set as well as your card layout and coloring. That beaver is the absolute cutest!! Such an adorable card.. Love the watercoloring. AWWWW Miss Liz Your card is so sweet!! Love your little scene so cute!! Super coloring job!! Love the special accent touches you gave to your little Beaver too cute and great idea for your red & white accent strip. You sure did an outstanding creative job. Yep sure did "Fall" for these new goodies...sooo can't wait to get it all in my scrappin' little hands...your idea would look so cute on a LO too!! Such an adorable card Liz! Love it, just makes me want to add the trees to my order. Very sweet fall card. Love the tree! Cute little card! You color beautifully! Aren't you glad Emma is giving us a chance to color again? Love these little critters! A sweet and classy showcase of this darling little beaver! The leaves and tree: perfect special touches! Love this adorable CAS card Liz! The critters are super cute! TFS! Very cute card design. I like the striped border. What a darling card! Super cute little critter~fun design! What a cute set, this new set is so cute, can't wait!!! Your card is adorable! This release is amazing. I did fall for this set...it is so adorable and I can't wait to play with it! 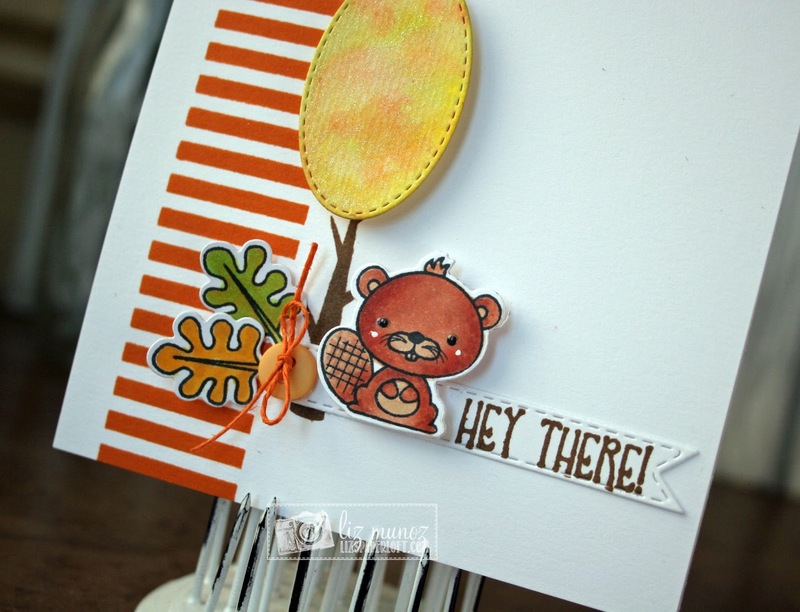 I love the way you colored the beaver and used the tree and geo stamp...nice card design idea! Very sweet card, love the coloring and the tree is beautiful. Your card is classy and cute, and clean, love the look and that cute little critter:) Thanks for sharing! Too cute and great coloring. Very cute card! This is such a cute stamp and die set and I really, really want it. great colors, and love your style! but I must have that stamp set !!!!!!! Cute cute card. Great job. 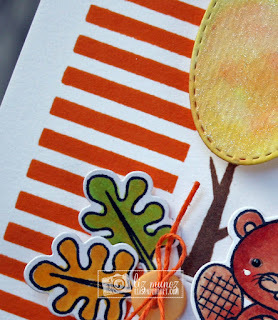 Great format for your card; the rust colored stripe is stunning. Your card turned out amazing ..... I love it ..... wonderful job.. Fantastic card! Love the stripes column and the fun beaver. What a neat set this is! Liz your card is super cute!! Love the coloring that you did and those sweet cheek accents are so sweet!! Great card for inspiration! Such an adorable scene and I just LOVE this little beaver. I think he's just the cutest! Loving this new release. Liz ~ this is so darn CUTE! Of course I love the way your colored the critter but the layout is fab along with all the MCT products too!